URBAN AGRICULTURE CAN’T FEED US, BUT THAT DOESN’T MEAN IT’S A BAD IDEA | "Global Possibilities"
Research shows that the social and cultural benefits of city farms and gardens far outweigh the number of people they can feed. Growing up in Iowa is a good way to become familiar with what a field of corn looks like. My eye is more readily drawn to its shiny, lopping leaves and the spike of an unopened tassel than to most any other plant. Driving across Los Angeles, as I do far too often, the crop still catches my eye, but the plots that it grows on here look nothing like the rolling farms back home that each measure in the thousands of acres. Instead, it’s a small berm pushed up against a park fence outside a homeless encampment, a narrow bed hemmed-in by wrought iron along a rougher stretch of Melrose, or an odd triangle of otherwise unused land created by a freeway on-ramp. All are home to tiny cornfields with no more than 20 stalks each. It’s no wonder that corn is grown in the city. The grain, like the tortillas made from it, is such a mainstay of the Mexican and Mexican American diet that it plays a role in cultural identity too. Because nearly half of Los Angeles’ population is of Hispanic descent, corn plays a cultural and culinary role here, with golden ears as commonly depicted on murals in Hispanic neighborhoods, it seems, as Cesar Chavez or Aztec gods. But a dozen ears of corn (or, as was the case in my own tiny cornfield last year, one or two) aren’t going to yield all that much to eat. Such small-scale gardening is not what some of urban agriculture’s biggest boosters believe can and should be done in American cities. Proponents of large-scale indoor or vertical farms—tricked out with high-tech moisture- and nutrient-monitoring systems to reduce inputs, and recirculating hydroponics or aquaculture systems that promise sustainable production—imagine a future in which rural farmland is used to grow row crops, such as corn and other staples, and high-nutrient, high-value vegetables are grown in tighter spaces more within the city limits. Not only would this shorten the supply chain, the argument goes, but it could provide jobs, reduce carbon emissions and water use, and generally help to create a more sustainable food system. But the mini corn plots, with their low yields and high cultural relevance, might be a more realistic example of what urban farming is capable of doing for a city, according to a new review from the Johns Hopkins Center for a Livable Future of previously published research looking at the promise and limitations of urban agriculture. 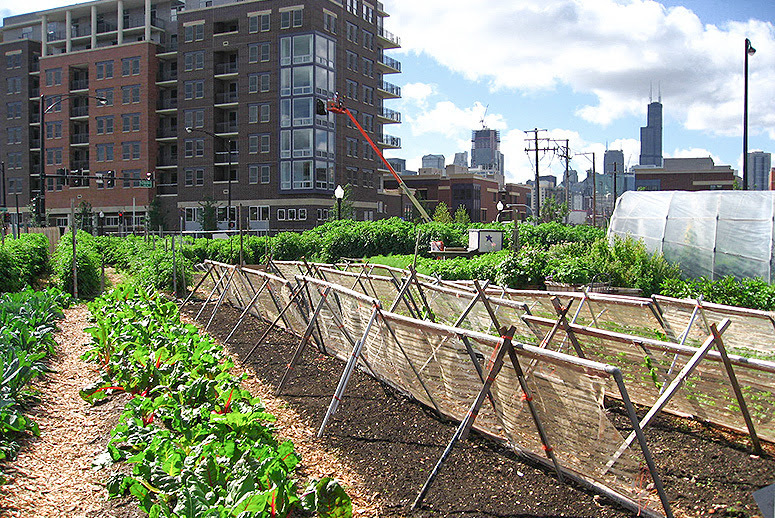 Related: Can Urban Agriculture Feed the World’s Growing Cities? “I don’t think these big sweeping urban agriculture ideas are going to happen anytime soon,” said Raychel Santo, a program coordinator at the Center for a Livable Future and a coauthor of the report. Of all the benefits of urban farming that proponents like to tout—Santo, a master gardener, said she comes to this with a pro–urban ag bias—the social aspects are the strongest. The promises of self-sustaining cities, enormous job creation, and the potential to upend the agriculture industry have yet to come to fruition. Still, Santo said, “I wouldn’t rule out urban agriculture as something we shouldn’t be doing because it can’t be a panacea for all of our problems.” If urban farms cannot make the food supply carbon-neutral, they can help reduce heat islanding. If urban farms cannot bring an end to food deserts, they can help supplement people’s diets with affordable, nutritious fruits and vegetables on a seasonal basis. “I think that we have to be really careful about how we communicate the potential of urban agriculture,” she added. “If we overstate what it can do, we could lose a lot of its support” when such lofty goals aren’t met. California, with its year-round growing season and booming traditional agriculture industry, is one of the places where urban farming has both been sold as something like a panacea and received a lot of support with hopes of making some of those promises real. The state has its drawbacks—the largest being the crushing drought that’s into its fifth year—as a potential hub for urban agriculture. But if the ag sector uses 80 percent of California’s freshwater resources, then why not redirect some of the comparatively small amount of water used to irrigate lawns and other landscaping to grow food in urban areas? After all, Los Angeles was once the top-producing ag county in the U.S. In 2014, the state passed the Urban Agriculture Incentive Zones Act, which extends property tax breaks to landowners who use vacant lots that fall within certain boundaries to grow food for at least five years. Los Angeles and San Francisco adopted the act the same year, and a report from the Los Angeles County Assessor’s Office found that 57,000 lots would be eligible for the program. So far, just one garden in Potrero Hill, a neighborhood in San Francisco, is using the program, earning roughly a $6,000 annual tax break, according to Eli Zigas, food and agriculture policy director at the nonprofit San Francisco Bay Area Planning and Urban Research Association, which advocated for the act on the state and local levels. Even if the incentive has yet to be wildly successful in the Bay Area, the demand for the tax break, as it were, should help put to rest the notion that “urban farming is making San Francisco’s housing crisis worse,” as one Atlantic story declared in 2014. As Zigas said, echoing the findings of the Johns Hopkins report, the goal is not to find enough land for a city to feed itself. Even if that were the case, the money in tax breaks that property owners could earn by turning their land into farms pales when compared with the revenue they could earn by developing housing in the top real estate market in the country. “It’s hard enough to make a living selling what you grow as a rural farmer. It’s even harder when you have the urban costs of doing business and the cost of living in a city,” Zigas said. When developing policies or projects to expand urban agriculture, it should be understood that “the primary benefit is educational,” Zigas said. “The real value of urban agriculture isn’t in terms of the number of people it feeds but in the number of people it touches and educates.” Much like a public park or an urban nature preserve, which allows urban residents to connect with the native ecology of a place, urban farms can provide residents a way to connect with the natural process of growing food—and that connection has value, even if it doesn’t mean that a lot of what they eat is grown within city limits. Even if the social and educational potential of urban agriculture is great, as first lady Michelle Obama has shown with her focus on teaching and community gardens, there are still questions about access and audience that the report says need to be addressed. Just look at the one plot taking advantage of the tax incentives in San Francisco: The median list price for a home in Potrero Hill is $1.1 million, according to the real estate website Redfin, just above the median price for the city as a whole. Potrero Hill is not the neighborhood that has the most to gain from the kind of social and educational benefits that urban agriculture can provide. Even in communities where food issues—from access to hunger to diet-related disease—are more acute, the Johns Hopkins report highlights the common problem of white, well-off organizations using cheap, accessible land in such neighborhoods while “unintentionally excluding people of color from participating in or reaping the benefits of such efforts.” As Brandon Hoover, director of sustainability at Messiah College, wrote in a paper quoted by Santo and her coauthors: “Is urban agriculture just another form of urban renewal, displacing underprivileged communities in the process, or is it an inclusive practice that works with marginalized people in the remediation of ‘their’ land?” On the flip side, community-led projects intended to serve minority or lower-income neighborhoods “have experienced disparities in access to land, government funding, and political support compared to urban agriculture efforts led by white and middle-class groups,” according to the report. Santo pointed out that “there are a lot of studies showing that for lower-income or minority groups, this is a good way for them to maintain some food sovereignty” and to access crops that they might not be able to obtain at local grocery stores. That’s the case with many of the mini corn plots found in backyards (and front yards and freeway medians) and community gardens. A recent study of corn varieties grown by Hispanic communities in Los Angeles and Riverside found that the gardeners are helping to conserve a significant amount of biodiversity, both in terms of the variety of corn grown and the DNA of the plants themselves. While growing the same criollo or heirloom corn in Boyle Heights that was sown across acres at a family’s ancestral home in Mexico has significant personal and cultural relevance, the genetic diversity maintained in such corn varieties—which are often drought-tolerant and can be grown with few inputs—could help provide the basis for future varieties that could withstand the harsher climate rural farmers are coping with. “Urban agriculture, while it can’t feed an entire city, at least maintains the knowledge of how to produce food,” Santo said. It allows generations who have never known rural life to have both the seeds and the understanding, even on a small scale, of how to feed themselves. That, she continued, could make us more resilient in the uncertain future.